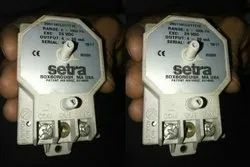 Providing you the best range of setra model 265 differential pressure transducer and setra model 265 differential pressure transducer range 0- 1000 pac with effective & timely delivery. 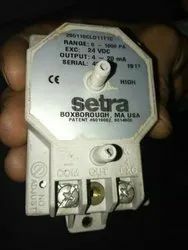 Setra Systems 265 pressure transducers sense Differential or gauge static pres sures andconvert this pressure difference to a proportional electrical output.The 265 is offered witha high level 0-5 VDC output or a 4-20 mA output.It is also offered with 0-5 or 0-10 VDC output in the 24 VAC excitation version. Used in Building Energy Management Systems, these transducers are capable of measuring pressures and fl ows with the accuracy necessary for proper building pressurization and air flow control. The 265 Series very low pressure transducers are available for air pressure ranges as low as 0.25 in. WC full scale up to 100 in. WC full scale. Static accuracy is±1% full scale in normal ambient temperature environments.The units are temperature compensated to less than ±0.033% FS/oF of thermal error over the temperature range of 0oF to +150oF. The Model 265utilizes an improved all stainless steel micro-tig welded sensor. The tensioned stainless steel diaphragm and insulated stainless steel electrode,positioned close tothe diaphragm, form a variable capacitor. Positive pressure moves the diaphragm toward the electrode, increasing the capacitance. A decrease in pressure moves the diaphragm awayfrom the electrode, decreasing the capacitance.The change in capacitance is detected and converted to a linear DC electrical signal by Setra’s unique electronic circuit. The micro-tig welded tension sensor allows up to 10 PSI overpressure range dependent with no damage to the unit.In addition, the sensor parts have thermally matched coeffi cients, which promote improved temperature performance and excellent long-term stability. Family Description - The Setra Model 265 Differential Pressure Transducer Provides Superior Positive and Negative Pressure Sensing Required For High Efficiency, Air-Control Systems. The Model 265 is a ±1.0% Full Scale Accuracy unit (±0.4%, ±0.25% FS Optional) With an Available Snap-on Conduit Enclosure Molded From High Impact Lexan®. Looking for Setra USA Model 265 Differential Pressure Transducer Wholesaler ?